Ultrasonic Physics, Second Edition, provides an introduction to the fundamental principles of ultrasonic physics. The book opens with a discussion of the sources of ultrasound. 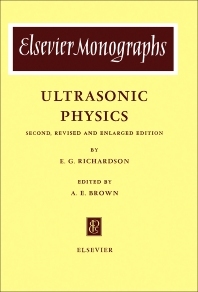 This is followed by separate chapters on the properties and detection of ultrasonic radiation; measurement of propagation constants, i.e., the velocity and absorption, of ultrasound; ultrasound propagation in gases, liquids, and solids; and ultrasound propagation in aerosols, suspensions, and emulsions. The final chapter covers miscellaneous physical and physico-chemical actions, including dispersion and coagulation of particulate matter, the break-up of liquid jets, acoustic birefringence, and the propagation of sound in the atmosphere and the ocean.